Fotor was mentioned as the 'lite Photoshop' by BBC and it will cater all your photography needs. 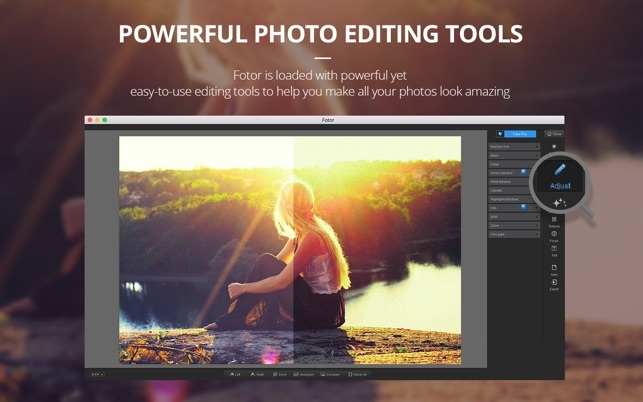 People everywhere are getting their edit on with Fotor’s solid photo editor for Mac! No matter whether you want smooth skin, to reshape your face, or make the way you look in portraits more lifelike, the touch up function helps you with all of that—deftly, and in double quick time. 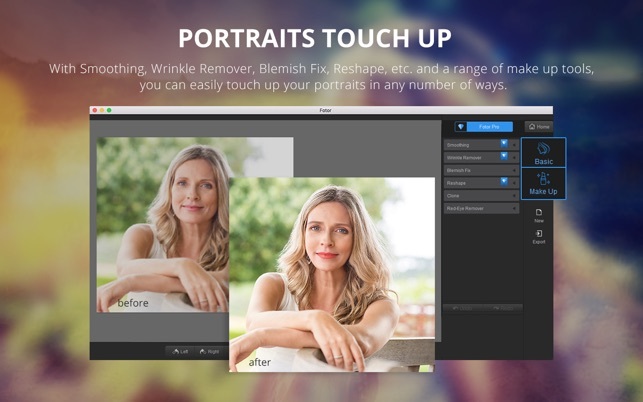 With basic tools such as: Smoothing, Wrinkle Remover, Blemish Fix, Reshape, Clone and Red-Eye Remover, you can touch up portraits with a single click. With make up tools such as: Eye Tint, Eye Shadow, Eye Liner, Mascara, Eyebrow Pencil, Blush, Lip Tint, and Teeth Whitening you can have a whole range of makeup at your fingertips. Quickly process dozens of photos to save time and efforts. 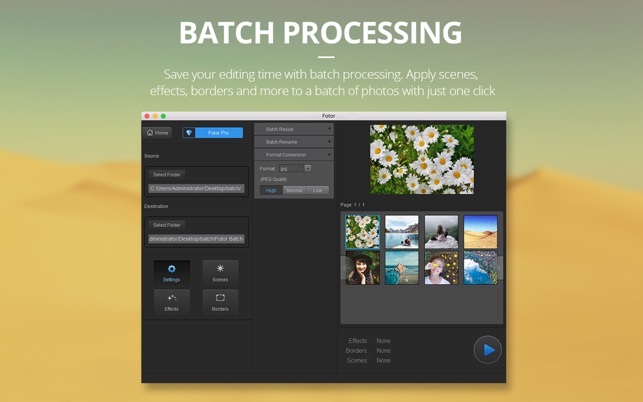 Batch processing can help apply Scenes, Effects, and Borders with one click, and can also quickly complete Batch resizing, renaming, and file format conversion. 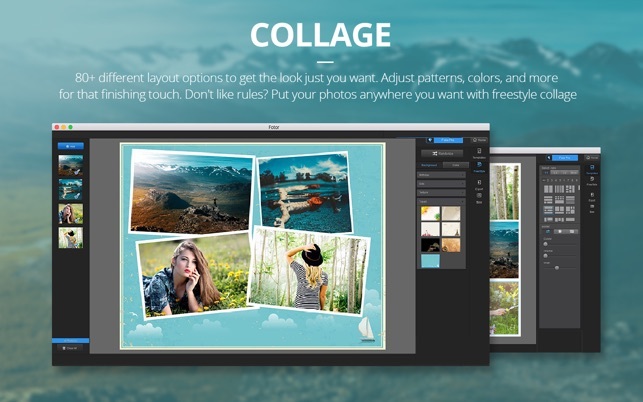 Versatile collage feature gives you a ton of flexibility to create and customize! Select from over 80 templates up to 9 photos at a time, or use Free Style to move photos around whatever you want with 26 unique backgrounds to choose from. Finish off your masterpiece with the border color that catches your eye, or select from 10 border designs. Even adjust border width, add a shadow effect or round off the corners. Fotor's state-of-the-art photo processing engine makes it easy to process high quality photos quickly. Adjust exposure, brightness, contrast, white balance, and saturation, sharpen/blur, highlights/shadows, HSL, add a vignette or film grain, remove red eye, reduce image noise, or crop, straighten, rotate, fix image distortion or correct lens distortion. Got something to say? You can now add text to any photo. Lots of options to adjust the font, size and color of your text till it looks perfect! Most photos aren’t taken in a controlled environment and often there isn’t time to adjust the settings on your camera. 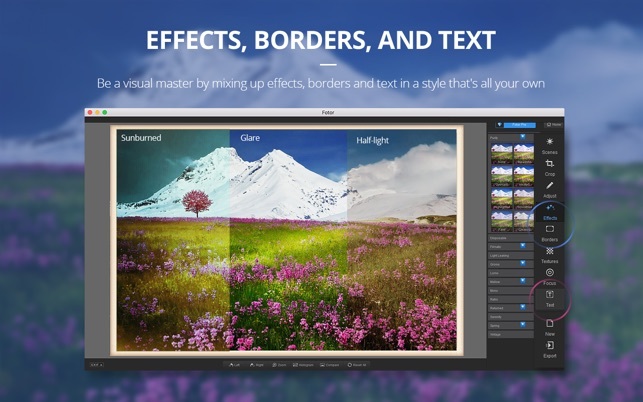 Enter the magic of Fotor. “Scenes” offers 15 1-tap-enhance options that have been configured for various photo capture conditions. Click now, adjust later. Fotor comes loaded with over 150 effects, including Classic, Retro, Lomo, B&W, and new popular packs of Cinematic, Disposable, Mono, Filmatic, Lighting Leaking, Groovy, Mellow, Spring, Warm Winter, Solar and Serenity. Over 60 styles of frames, including Simple lines, Borders, Artico, Styled, Floral, Old School, Holiday, Lovers, Gallery and Stamp. You can now apply different textures (up to 26) on images under variable shooting scenes just by a click. Unleash your creative inspiration by using a mix of clear focus and selective blurring. Fotor’s Focus editor gives your images the depth-of-field normally seen only on professional-grade DSLR cameras. 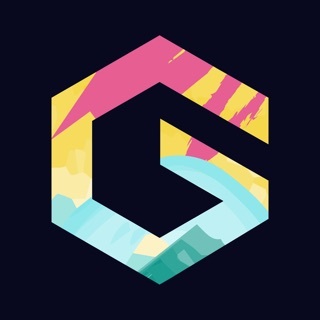 - Unlimited premium assets like effects, borders, textures etc. - Price may vary by location. Subscriptions will be charged to your credit card through your iTunes account. Your subscription will automatically renew unless canceled at least 24 hours before the end of the current period. You will not be able to cancel the subscription once activated. Manage your subscriptions in Account Settings after purchase. August 2017 Review - What is going on? Do we have to pay for Pro to be allowed to save images from the Edit function? Suddenly I cannot export any edited images. No matter what edits are made it says “Failed to save image” when trying to save it to my computer. If this functionality is now part of a paid version, then this app is officailly useless. December 2016 Review - This app used to be great, but the recent updates have made it infuriating and basically useless. Used to be able to drag and drop images from a folder into the app, albeit one at a time, which was silly but it worked. That feature has been removed. Each time you open a new image in Edit mode, the menu resets back to the beginning and you have to navigate to where you were. There is no way to store the prefered folder for saving images. Each time you open the app, the folder setting is cleared and has to be reset. When switching from Collage to Edit, the folder setting is also cleared. For the love of god Fotor, just make a permanent setting for this! And recently, the worst possible thing… every 3rd image edited or created, when you click on the browse button to select the folder that wasn’t saved the last time you selected it, the app freezes and stops responding. The only option then is to force quit, relaunch, reset all your settings, and start again. 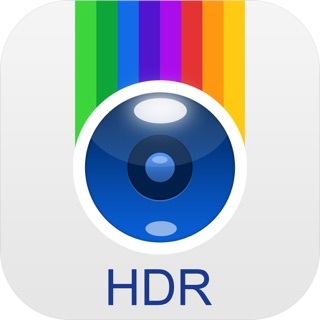 Seriously Fotor, get it together and hire some qualified people design your app and make it work. This isn’t rocket science. Meanwhile, I suggest that you could reinstall fotor. What few “problems" one has to solve to make this editor work (like how to save edited images) is far overcome by what it can do. The problems just take going online and asking; answers are available and solutions easy with instructions. But features like changing f stop settings on blurry pictures are very sophisticated and save a lot of otherwise trashable fast action shots (I saved almost 2 dozen rodeo shots on my first try that were otherwise too blurry to be any good). I haven’t even started to learn features like touch up. But once one gets into “adjust” and realizes that there are several ways to adjust lighting, sharpness, and other more subtle shadings to enhance or better yet to take what looks like a black picture and make it a beautiful shot makes this at least as useable as Photoshop Elements without the increasingly expensive monthly or annual fees for expensive film editors. I AM IMPRESSED! I’m a food blogger and use this app for creating collages of my photos. My opinion may therefore be less useful because I’m not using Fodor's Edit or Design functions and I’m using just a handful of commands in the Collage function. I also don’t change the photos, unless it might be to zoom in on the food. But after the complexity and clutter of Lightroom, I find Fotor refreshingly simple and direct. I have my collages created and posted in minutes. It’s an enormous convenience to my workflow and I highly recommend it. 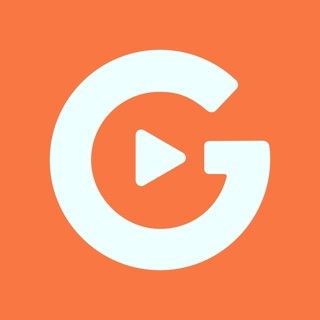 I downloaded the app, so I don’t have much experience with the online interface, but I’ve seen it and it looks similar to the app, which is pretty easy to figure out and to use. Keep in mind, that this app is FREE! It’s an outstanding value for the price. Update: I’ve gone to the Pro version because it’s still so inexpensive and the program is of great value to me.